The app for monitoring your HeaterMeter on your iOS Device. – Monitor all your sensor data live within the App. 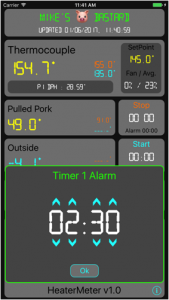 – Set timers for your meat. – Visual and Sound alarms within the App. – Notifications outside the app, ONLY for timers (yet). – Configuration of your HeaterMeter : Low temperature, High temperature, SetPoint, etc. * In App there is an e-mail button for reporting problems/suggestions. Copyright (c) 2016 – 2017 Mike Stokhof. All rights reserved.